BioFreeze pain relief is available with gel-roll-on and spray applicators. It contains an ILEX base, and an herbal extract for a quick onset, long lasting, pain relief. The pain relief formula is greaseless, stainless, and has a vanishing scent. 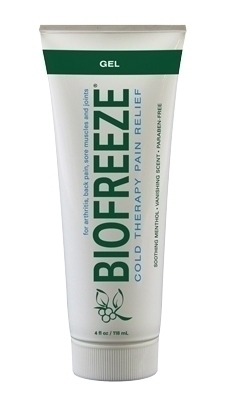 Lightly massage BioFreeze into all sides of sore muscles. Use to relieve pain from sore muscles and muscle spasms, back, shoulder, and neck pain, arthritis, painful ankle, knee, hip and elbow joints, and muscle strains. Use to relieve pain prior to massage therapy, soft tissue trigger point therapy, rehabilitation exercises, and pre and post workout stretch. BioFreeze contains menthol. Dimensions: 21" x 11" x 20"
Notice: Typically ships in 1-2 days.